It’s raining umbrellas in Omaha, thanks in part to AnythingPlastic. 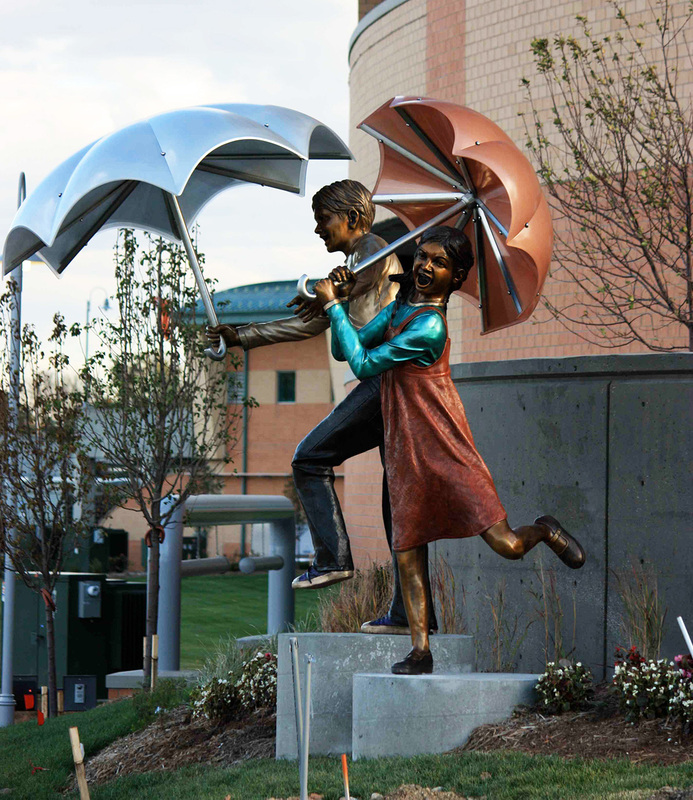 When the Omaha Children’s Hospital and Medical Center commissioned renowned artist Mathew Placzek to create a sculpture installation for their new addition opening in 2010, he knew it had to special. 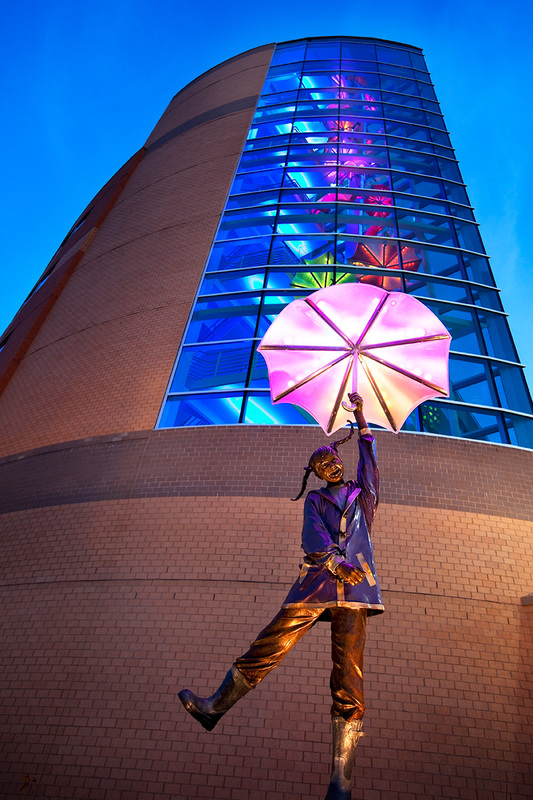 He envisioned bronze sculptures of happy children holding colorful umbrellas outside, then floating up a 75-foot interior staircase. 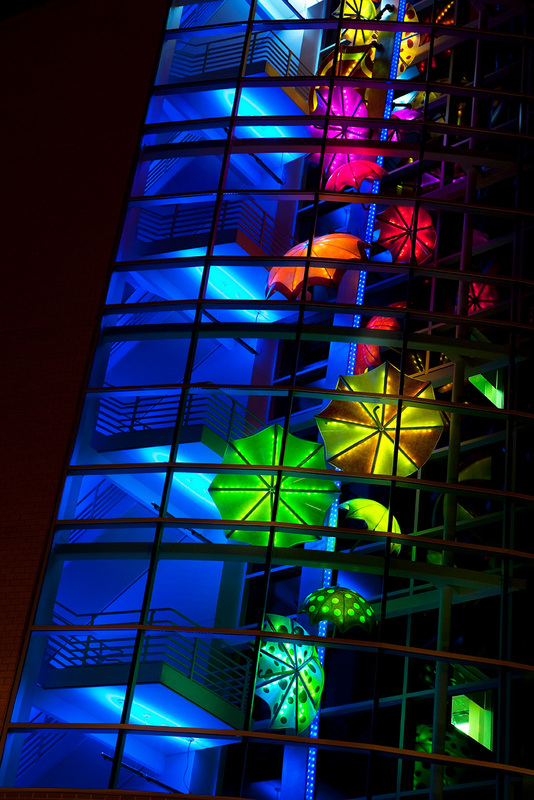 Matthew explained, “I wanted the work to symbolize the whimsical spirit of children, being lifted up and away from their troubles, sheltered by umbrellas and showered with light.” His concept was dependent on finding a way to create translucent umbrella canopies, illuminated from within by colorful LEDs. But how could Matthew’s concept make the leap to reality? Fortunately, he connected with the experienced plastics experts at AnythingPlastic in Ontario, California. “Imagine” was a complex project requiring creativity and collaboration by dozens of people. And like most artistic works, the umbrellas were original and unique, so there was no blueprint to follow. After consulting with Matthew to understand his specific vision and needs, AnythingPlastic came up with a unique way to use spider molds to drape the materials over the umbrella ribs, mimicking the appearance of fabric. AnythingPlastic fabricated a couple of small-scale prototypes to show Matthew, choosing impact-resistant polycarbonate since some of the pieces would be installed outdoors. Once Matthew had approved the samples, the AnythingPlastic team went to work creating the plastic canopies. They had to meet Matthew’s exact specifications to fit perfectly over the ribs, ranging from 4–7 feet in diameter. Contact AnythingPlastic today at 909.930.5535. Polycarbonate umbrellas created by AnythingPlastic were essential to bringing artist Matthew Placzek’s sculptures to life in Omaha, Nebraska.